It is quite common to dream about the death of someone close such as friend or relative. These dreams can be very upsetting because the natural tendency, especially for those who have not observed dreams in depth, is to assume the dream has a literal meaning. Therefore, the dreamer will often mistakenly assume the person in the dream who died will really die. In many, and perhaps in a majority of cases, this is not the meaning of the dream. So what does the dream mean? In fact, the dream could have one or many meanings! This _______ person reminds me of times when I am ________. Lately, I haven’t been so _____. Could this dream mean that that part of me has died or is dying? Why? Does the dream give clues? How does the person die in the dream? Is something similar happening to me right now? Dreams can also give us insight into our relationships with people. To dream of someone dying may be telling us that our relationship with that person is dying or changing so dramatically that it may be unrecognizable. It is important to reflect on the relationship and ask if the relationship might be ending or changing dramatically and perhaps make choices that will resuscitate or enrich the relationship, if that is desired. There are times indeed when dreams do foretell the actual death of a person, often in a graphic and realistic manner that also comes true. I had a dream of watching my mother die in the arms of my father. As soon as I had the dream, I “knew” this dream was a predictive one. I made the decision to go back to the family home to visit with my parents, suspecting this might be the last chance I would have to see my mother. I was glad I did because a short while after she passed away. What surprised me was that she died just as my dream indicated, in the arms of my father. It was as if I had been a fly on the wall and had seen it all transpire ahead of time. It is possible to also see one’s own death ahead of time. Abraham Lincoln had a famous dream just a few days before he died of seeing his coffin laid in state in the White House. A person may also dream about the Grim Reaper visiting, or an angel or possibly a relative who has already passed come to get the dreamer. Again, the dreamer usually knows at a deep level the meaning of this kind of dream. So when you dream of someone dying, go through the reflection process above and don’t let false or neurotic fears carry you away. Chances are, if your dream is a predictive one, you will know it at the gut level, giving you a chance to prepare for the end. 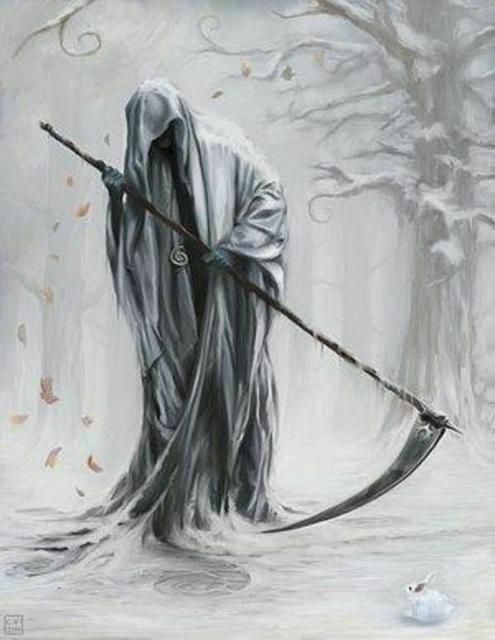 This entry was posted in Dead Men Do Tell Tales, Dreamwork Methods, On Dreams, Uncategorized and tagged angel of death, death, death dreams, dreams that foretell death, dying, dying in dream, family member, friend dying in dream, Grim Reaper, predictive dreams, prophetic dreams. Bookmark the permalink.